I would absolutely love it if you took a second to vote for my submission to the Bundle Monster nail art contest! Thank you! Onto the aaaaaaart (said in a deep, low, drawling voice, swirling a glass of wine or brandy, nose straight up in the air). I wanted to use my dotting tools again. I love those guys. The colors I used were Farah (Zoya), Cote D'Azur (Icing), and Pull Over (Sinful Colors). Ok, odd coincidence. As I typed that, an ambulance drove by outside somewhere, and the sirens echoed right into the windows. Cosmic voices from the nailiverse have spoken! If you're around a Claire's, or a Claire's Club, or an Icing store, I recommend stopping in. While the formulas on the polishes are a bit lackluster, the colors actually are quite eye-catching. Plus, they're pretty cheap, and it's fun to relive your little girlhood with the goodies they have there. I went for the sole purpose of picking up Candy Shop, but wound up with four bottles of colors I was really quite excited about. It's worth the trip! Love the color choices on this! I know what you mean about Claire's, I went in for Candy Shop also and was intrigued by the mood polishes. 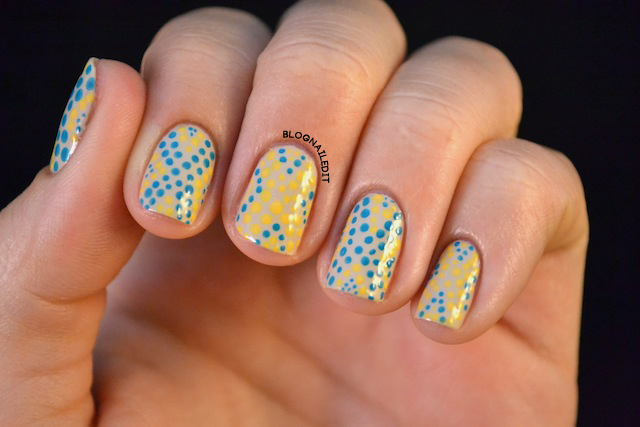 I love these dots. The color combination is perfect. It actually reminds me of a yellow and blue tie I was looking at tonight in Dillard's. Lol!